The Watch Factory Restaurant is one of our favorite places to eat. The restaurant gives you a sense of home and Chef Marcus is an unbelievable Chef. his food is exquisite, unique with an Austrian flair. No only is Chef Marcus a fabulous Chef, he is incredibly generous. He offered to host “Cooking for a Cure”, a benefit for the Tommy Fund given by Jesse Liska, at his restaurant. 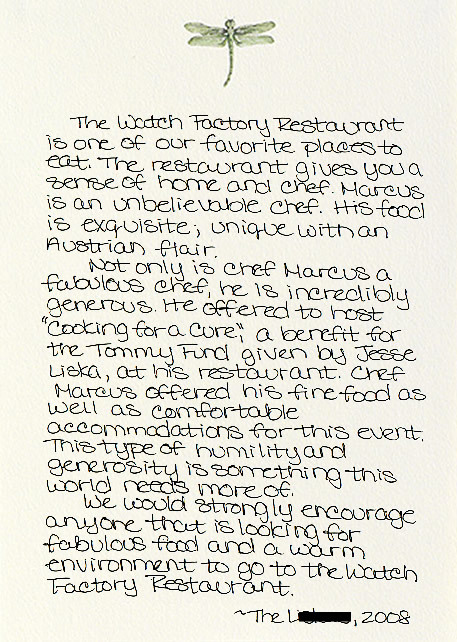 Chef Marcus offered his fine food as well as comfortable accommodations for this event. This type of humility and generosity is something this world needs more of. We would strongly encourage anyone that is looking for fabulous food and a warm environment to go to the Watch Factory Restaurant.